The ending of Oklahoma State’s 38-35 victory over Texas on Saturday night got a little beef-y when Longhorns coach Tom Herman had to be restrained from coming at Cowboys coach Mike Gundy right there on the field. For a moment, this one had some real sizzle. But in the end, there was nothing to savor. Things got cooking as Oklahoma State took a knee in the waning seconds and Texas defensive end Breckyn Hager mixed it up with a few Cowboys players. 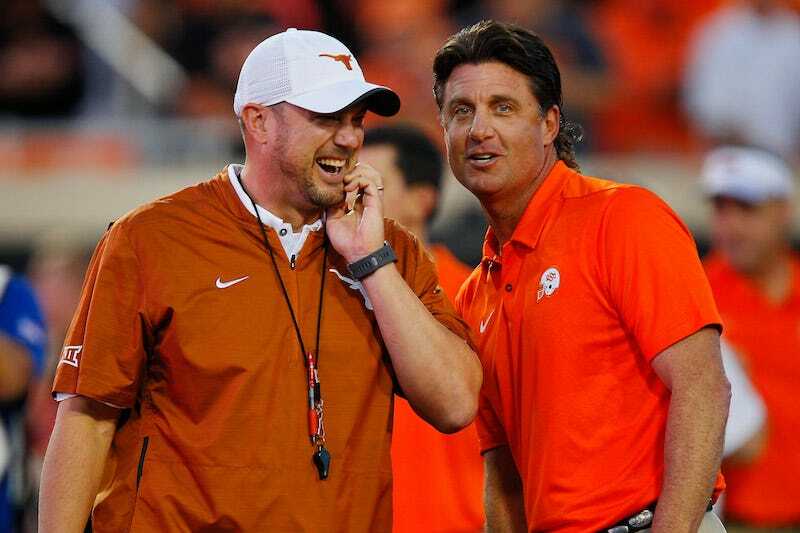 Gundy reacted by sprinting onto the field, which prompted Herman to do the same—and Herman was pissed. Gundy did appear to be trying to restrain his players, but that’s not what it looked like Herman saw. Watch for yourself. Herman wound up getting flagged for unsportsmanlike conduct. The post-game handshake promised to be thick and juicy. Alas, it wasn’t meant to be.